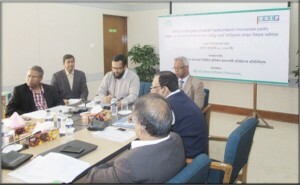 PKSF, over the years, has gained in-depth understanding and valuable experience on the multi-dimensional aspects of poverty and acknowledge the fact that Bangladesh is well-placed to benefit from the demographic dividend up to 2050, and believe that combined with effective policies and markets could trigger faster rates of economic growth and human development. Thereby, accept as true that human resource plays a vital role in the knowledge economy and working population and it is becoming an increasingly important factor for the performance of individuals, organizations and whole economies. However, the upgrading of skill based labor market due to technological and organizational change is one of the major threats for the low skilled workers in Bangladesh, as they are being unable to adjust their skills according to the market demand. 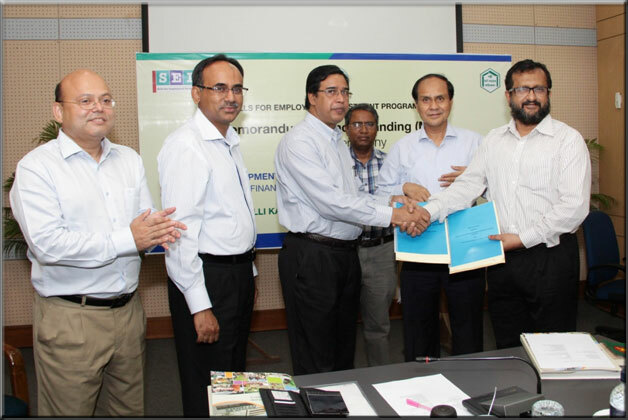 In this context, PKSF has agreed to implement the ‘Skills for Employment Investment Program (SEIP)’project and signed the MoU with SDCMU on 7th May 2015 to ensure training and employment for the poor and marginalized people of the country so that they can develop their living standard sustainably. 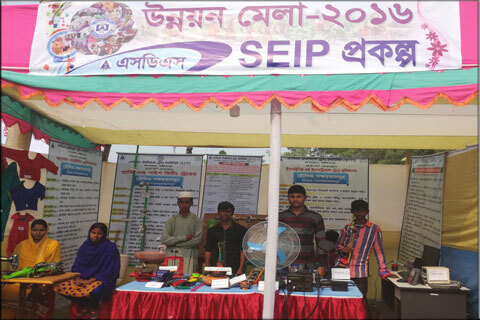 PKSF will make sure demand driven skill-based training among the poor people under the SEIP project with a view to create wage and self employment. The Finance Division of Ministry of Finance, Government of Bangladesh (GoB) is working as the executive agency to implement this project. The Finance Division has established ‘Skill Development Coordination and Monitoring Unit’ (SDCMU) to execute the project. Under the direct supervision of SDCMU, different organizations including PKSF are implementing the project. Asian Development Bank, Government of Bangladesh and Swiss Agency for Development and Cooperation (SDC) are jointly financing the project. Increase income of the trained trainees. It is expected that 20% income of the trainees’ House Holds (HHs) will be increased after receiving training under this project. Increase the number of skilled workers in priority sectors around the country. Produced around 10,000 skilled and semi-skilled workers under six priority sectors. At least 70% of the total trainees will be employed after training and retained in respective jobs for six months. The ratio of wage and self employment of the employed trainees will be approximately 60:40 of 70% total trainees. SEIP entails three major tasks viz. ; selection of appropriate trainees, selection of renowned and efficient training institutes and job placement of the passed out trainees, which are equally important as well as very challenging for the successful implementation and goal achievement of the project. Selection of Appropriate Trainees: PKSF will select the trainees through its Partner Organizations (POs) from their organized group members under inclusive financing program. Trainees’ selection will be finalized after conducting screening test and viva voice through the POs. Trainee of age 15 or above will be selected from the partner organizations of PKSF where project will bear all expenditures of trainees except only 10% of the accommodation and food cost to ensure effective participation. Initiatives will be taken to encourage participation of the people with disabilities, ethnic minority and female trainees. 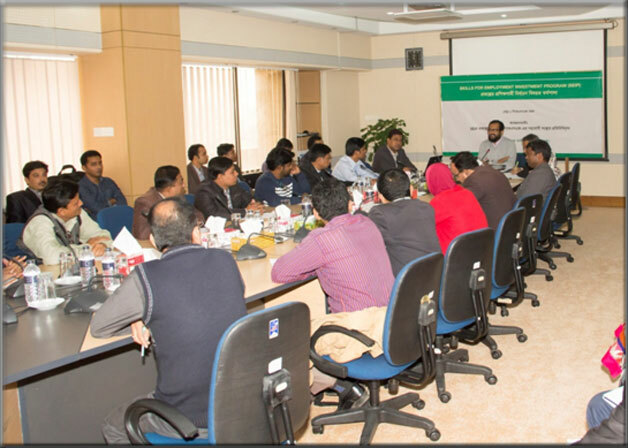 Selection of Qualified Training Institutes: PKSF will select renowned training institutes functioning in Bangladesh to impart market responsive inclusive training. PKSF will ensure delivery of standard course for each training/trade course through the selected training institutes. The course structure will need to be reasonable which are required to show an appropriate balance between compulsory and elective components, theoretical and practical requirements. Practical and theoretical contents of the course-curricula should be 80:20. Job Placement: PKSF will ensure job placement of the trainees within 6 months of each training program. Selected training institutes will assist PKSF to ensure job placements. The job placement services will ensure the following: i) preparing database of the relevant industries; ii) developing dynamic linkages with the employers; iii) disseminating training outcomes to the employers; iv) organizing job fair and dialogue with potential employers; v) identifying job vacancies in industry and preparing trainees for interviews; v) preparing documents that show wage/remuneration before and after training to indicate value addition of training in case of up skilling and vii) assisting the implementation of Trainees Tracking System. PKSF has the capacity and experience of promoting programs/projects with national coverage through 7,000 branches of 203 active POs. POs which are working for marginalized people in various remote places of the country have been considered for the project. They will prepare an initial training participant list for the project from which PKSF SEIP Project Management Unit (PMU) will finalize the training participants following a rigorous screening process. Considering the overall institutional capacity like governance and management; personnel; physical structure and learning resources; support services; development, delivery and review of curriculum; assessment and certification process, 22 reputed training institutions have been selected to provide quality training to the selected trainees in different regions of the country. A project Management Unit has been formed for the appropriate implementation of the project. Awareness among the targeted training participants, POs, Employers and other stakeholders is very crucial for the demand driven training and subsequently job placement on which success of the project depends. Considering paramount importance of the information symmetry among various stakeholders SEIP will organize several meetings, seminars, workshops and other programs. Moreover, SEIP also will publish a range of documents including brochure, quarterly project implementation updates, etc. for the sake of knowledge dissemination among the relevant stakeholders. On 12th May 2016, under SEIP project a Grant Agreement among PKSF and Sir William Beveridge Foundation was signed based on the decision of 200th Management Board meeting of PKSF aiming to develop Skilled and international standard Caregiver and Nursing Assistant from Bangladesh. The agreement was jointly signed by Mr. Golam Touhid, Deputy Managing Director (Finance), PKSF and Mr.Jibon Kanai Das, Country Representative, Sir William Beveridge Foundation. Under this agreement, Sir William Beveridge Foundation primarily will provide one (01) month training to 20 persons to develop Skilled and international standard Caregiver and Nursing Assistant workforce and consequently make sure the job placement of the trainees. An agreement has been signed between Palli Karma-Sahayak Foundation (PKSF) and the A K Khan Healthcare Trust (AKKHT) on 29th June 2016 at PKSF Bhaban with a view to train persons to become expert “Caregivers” who are enabled to meet international standards. The agreement was signed by Mr. Md. Fazlul Kader, DMD (Program) on behalf of PKSF and Ms. Samanzar Shama Khan, CEO of the organization on behalf of AKKHT. Mr. Md. Abul Kashem DGM (Program) and Mr. S M Khaled Mahfuz, Program Officer of PKSF and Ms. Faria A Mustafa, Program Director of AKKHT were also present at the signing ceremony. PKSF and AKKHT have been providing scholarship to 15 students who will pursue academic program leading to award of Pearson BTEC (Business & Technology Education Council) Higher National Certificate (HNC) in Health & Social Care following British curriculum. Besides BTEC-HNC, students are expected to receive the Australian Certificate CHARLTON BROWN, in Individual Support (Ageing). In addition to these internationally recognised qualifications, students will be provided skills in Non-Verbal Communication, Verbal English Language, Computer and Software Skills. After completion of 1 year successful training in Bangladesh, AKKHT will assist students to pursue their higher education in abroad along with paid apprenticeship. In tranche-1, PKSF-SEIP project is aimed to provide trainings for 10,000 youths of low income families around the country through selected Training Institutions (TIs). Thus, during the period of December 2015 to June 2016, two thousand four hundred and thirty six (2436) participants (Male: Female 81:19) have started their skills development trainings (Three and Six months courses) based on selected trades. As on December 2016, three thousand one hundred and twenty eight (3128) trainees have completed their training successfully and one thousand seven hundred and ten (1710) of them have been placed into employment during December 2015 to December 2016. Project Management Unit (PMU) has organized a daylong workshop on TMS software of SEIP on 22 September’16, at PKSF Bhaban. The workshop, aimed to facilitate appropriate data management, was organized for the capacity development of the MIS officers of training institutes (TIs) on the updated TMS through practical demonstration. Md. Abul Kashem, Deputy General Manager & Project Coordinator of SEIP, PKSF has inaugurated the workshop. Mr. Faisal Hasan, IT & Database Specialist of SDCMU, Mr. Abu Jafor Al Forhad, Project Coordinator, Tapware Solutions Ltd. have conducted the workshop along with the MIS officer of PKSF-SEIP. 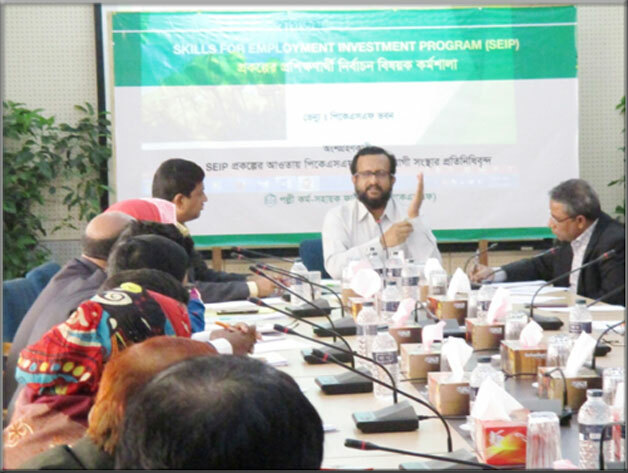 Besides, Deputy Project Coordinator (DPC, Technical) and Program Officers of PKSF-SEIP were also present in the workshop. 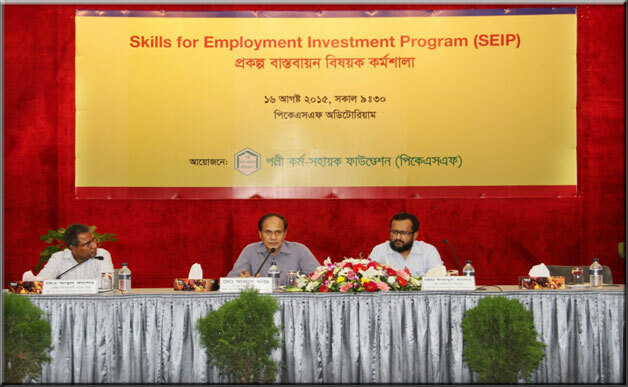 One of the major objectives of SEIP project is Industry-demand driven workforce development. That’s why the appropriate selection of the project participants is an important factor. Therefore, highlighting the importance of appropriate selection of project participants under SEIP project, thirteen (13) workshops had been placed with Partner NGOs of PKSF as the project participants are selected through them. The venues were in; DESHA, Kushtia, Jagoroni Chakra Foundation (JCF) Jessore, Nabalok Khulna, Satkhira Unnayan Samity (SUS) Khulna, Friends in Village Development Bangladesh (FIVDB) Sylhet, Paige Development Center Comilla, TMSS Rangpur, TMSS Bogra, TMSS Natore, Gono Kallayan Trust (GKT) Manikganj, ASPADA Mymenshing, Bangladesh Development Society (BDS) Barishal, Society Development Committee (SDC) Faridpur from 27th March to 19th May 2016.Wherein, the Executive Director, Director, Regional Manager, Branch manager of almost all the (164) Partner Organizations of PKSF was present. Personnel from PKSF and SEIP project coordinated all the workshops. Objectives of SEIP project, current challenges of selecting participants for the project and the steps of approved trainee selection that the POs should follow. 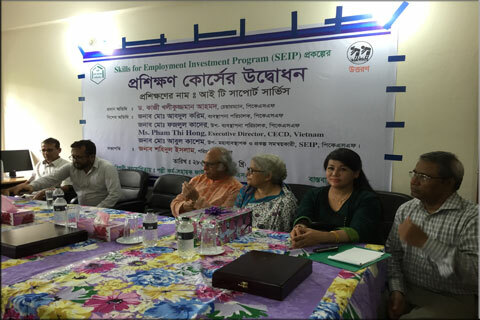 Besides this workshop, two major workshops on the topics of ‘Job Placement’ and maintaining proper ‘Finance & Accounts guideline’ towards the endurance of effective implementation of the project took place under SEIP project at PKSF Bhaban. On 12th January, 2016, General Manager of Audit Department, PKSF presided over the Workshop of ‘Guideline of the management of Finance & Accounts of SEIP project’. Wherein, Accountants of 22 selected Training Institutions’’ participated and an overview and detailed process of the management of Finance & Accounts of SEIP project were discussed to ensure the proper delivery and management of the Accounting system by following the Financial Guideline. On 23rd June 2016, Deputy Managing Director (Operations) presided over a workshop on ‘Job Placement’ of the SEIP Project trainees. The importance of the proper job placement process was discussed among the personnel of selected 22 training institutions. The designated job placement officers of the Training Institutions’ shared their experiences of current job placement procedure of SEIP Project and as well as made suggestions towards a better Job Placement process of the project in the workshop. On 18 March 2016, Mr. Jalal Ahmed, National Project Director, SEIP visited the ongoing training program of IT support service trade at Eco Social Development Organization (ESDO). During his visit, Mr. Jalal Ahmed, observed training and job placement activities and expressed his satisfaction. Along with him, Mr. Sarwar Mahmud, joint secretary of Economic Relations Division (ERD), Ministry of Finance, GoB, Mr. Mukesh Chondro Biswas,District Commissioner (DC) of Thakurgaon district and Executive Director of ESDO were also present. On 26August 2016, honorable Chairman, Qazi Kholiquzzaman Ahmad and Mr. Fazlul Kader, Deputy Managing Director (Program), of PKSF visited training program of SEIP at RRF, Jessore. During the visit, trainees of different trades displayed their innovative works. On 28 August 2016, honorable Chairman, Dr. Qazi Kholiquzzaman Ahmad, Managing Director Md. Abdul Karim and Deputy Managing Director (Program) of PKSF Mr. Fazlul Kader along with Project Coordinator of PKSF-SEIP visited Uttaran, a TI under PKSF-SEIP. Honourable Chairman inaugurated training of a batch on IT support services trade at the Tala training center of Satkhira, Uttaran. During the visit, honorable chairman highlighted the importance of quality training, and suggested to include awareness issues like; early marriage, violence against women, drug addiction in the curriculum and course modules. He also expressed his satisfaction regarding the ongoing training. On 25 August 2016, Mr.Fazlul Kader, Deputy Managing Director (Program) of PKSF visited TMSS, Kazipara Mirpur Dhaka center. He awarded certificates among the trainees who have successfully completed the training on Web Design & Graphic design course. On 23 December 2016, Executive Project Director of SEIP, Mr. Abdur Rouf Talukdar visited the training center of UCEP, Barisal of PKSF-SEIP project. During his visit he exchanged views with UCEP officials about the trainings and job placement issues. He also visited the training venue and enquired about training program. 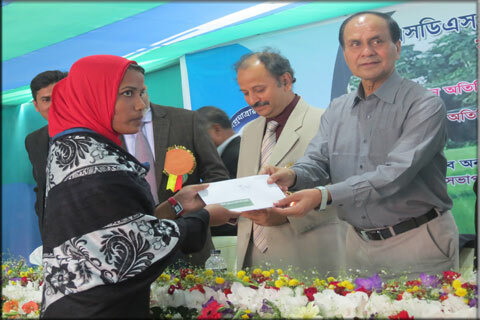 He expressed his satisfaction about the overall training program of UCEP Bangladesh. During the visit, Mr. Abul Kashem, Deputy General Manager of PKSF and Project Coordinator, PKSF-SEIP was also present. 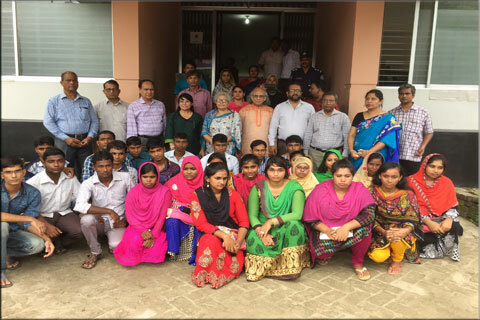 On 16th April 2016, delegates of ADB, one of the donor of SEIP project and personnel of Support to Skills Development Coordination and Monitoring Unit (SDCMU) visited one of the current training activities of the training institution, Bangla German Samprity (BGS)Tangail of SEIP. Project coordinator of SEIP, Deputy General Manager (Operation) PKSF, Md. Abul Kashem guided the team on behalf of PKSF. The team was consisted with Mr. Rudi Van Dael, Senior Sector Specialist and A.K.M. Shamsuddin, Consultant from ADB, Mr.Erich Guttman, Backstopper, SDC; Syed Nasir Ershad, AEPD, SEIP and Md. Ahsan Habib, TVET Specialist, SEIP from SDCMU. The team conveyed their contentment regarding the Training Activities and Overall Management of the project work throughout the visit. On 24th of June 2016, Dr. Zowadul Karim KhanProgram Manager of Swiss Development Coordination Agency (SDC), visited the training centers of Under Privileged Children Education Program (UCEP) in Khulna and Rural Reconstruction Foundation (RRF) in Jessore. The ongoing training activities of various trades had been viewed by him and he was accompanied by one of the program personnel of PKSF-SEIP. On 3 November 2016, Dr. Qazi Kholiquzzaman Ahmad, Chairman of PKSF was invited as the chief guest of the certificate giving ceremony of training program at Mars solutions ltd under PKSF-SEIP. Honorable chairman handed over the certificates to the trainees of IT Support Service and Web Design and Graphic Design courses. Along with honorable Chairman, Dr. A.K. Abdul Momen, former Bangladesh Ambassador and Permanent Representative to the UN, Dr. Jamaluddin Ahmed, Director of Bangladesh Bank and Mr. Md. Fazlul Kader, Deputy Managing Director of PKSF and Mr. Abul Kashem, Deputy General Manager of PKSF and Project Coordinator, PKSF-SEIP were also present in the occasion. Thirty three trainees had received their job appointment letters from the honorable chief guest during that program. On 25 and 26 December 2016, Md. Abdul Karim, Managing Director, and Mr. Fazlul Kader, Deputy Managing Director (Program) of PKSF joined in the 25 years’ celebration ceremony of SDS and inaugurated the training programs of Fashion Garment, Mobile Servicing and Plumbing & Pipe Fittings trade courses under SEIP project. During the occasion, honorable Managing Director handed over job appointment letters to 10 graduated trainees. They also visited stalls and exhibitions organized by the SDS trainees at the SDS premise. In his speech, honourable Managing Director highlighted the importance of the vocational education and training in Bangladesh to keep pace with the current development momentum of the country. He also stated the necessity of delivering quality training and requested SDS to take initiatives to send the qualified trainees abroad with suitable jobs after completion of their training. On 27 October 2016, Mr. Abdul Karim, Managing Director, PKSF handed over the certificates to the trainees of IT Support service trade courses of ESDO as chief guest. Along with him, Dr. Sharif Ahmed Choudhury, Deputy General Manager, PKSF and Dr. Md. Sohiduzzaman, Executive Director, ESDO were also present in the event. 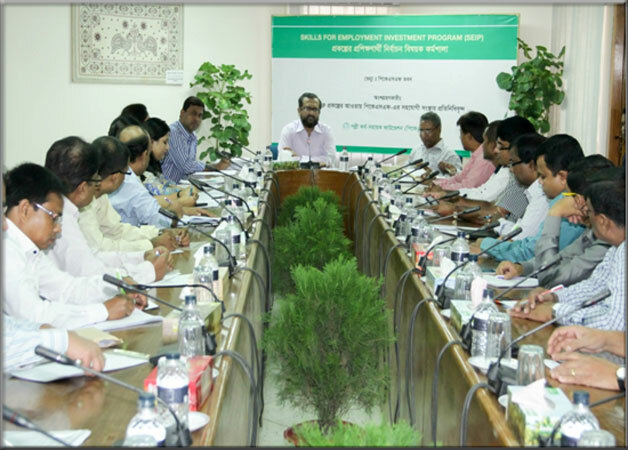 Honorable Managing Director emphasized on the proper utilization of the potentials of the Demographic Dividend in Bangladesh.